Open desert surrounds the Desert Sunlight solar project near Desert Center, in eastern Riverside County. In at least one area, President Trump is picking up right where former president Barack Obama left off. The Interior Department said Thursday it plans to approve the Palen solar farm, which would be built on public lands just south of Joshua Tree National Park, in the open desert east of California's Coachella Valley. The 3,100-acre, 500-megawatt power plant would be one of the country's largest solar projects, generating enough renewable energy to balance out the planet-warming emissions of 17,000 average homes in nearby Palm Springs. But Palen has been criticized by some environmentalists, who say building a large industrial facility on the doorstep of the national park could have devastating impacts to natural ecosystems. They're especially concerned the project would interrupt a sand transport corridor that feeds the sand-dune habitat of Mojave fringe-toed lizards, desert kit foxes and other species. Native American groups have criticized the proposed solar project as well, saying it would destroy ancient tribal artifacts and sacred sites. But short of a lawsuit, there's not much to stop the Trump administration from approving the project. The Interior Department released the final environmental impact analysis for Palen on Thursday, affirming a tentative decision from October to move forward with the solar farm. The public has until June 20 to submit written protests before the Bureau of Land Management, an Interior Department agency, issues a record of decision. Solar: A radio magnate wants to build cell towers in the California desert. Trump might help. Tesla: Tesla built the world’s biggest battery. This one could be three times bigger. Palen is the first big solar project on public lands to get the go-ahead from Trump's Interior Department. The decision reflects a rare area of agreement between the Trump administration and the Obama administration, which approved 58 renewable energy facilities on public lands, although many of them still haven't been built. "The BLM is committed to supporting responsible energy development that stabilizes the grid and strengthens the nation's energy infrastructure," Beth Ransel, manager of the federal agency's California Desert District, said in a written statement. "We welcome opportunities to help make public lands work for local communities." It's unclear when Palen's developer, San Diego-based EDF Renewable Energy, plans to start construction. The company has suggested it could build Palen at the same time as it builds Desert Harvest, a 150-megawatt solar project on public lands near Palen. Desert Harvest was approved by the Bureau of Land Management in 2013. Interior Secretary Sally Jewell, right, and Georges Antoun, COO of First Solar, tour the 550-megawatt Desert Sunlight solar farm on Feb. 9, 2014. "We're really happy to see BLM put this out," said Ian Black, the EDF executive responsible for the firm's California solar portfolio. "We're happy to see movement out of D.C. on renewable energy. And we're really happy to work with this new BLM." The lands south of Joshua Tree National Park and north of Interstate 10, in eastern Riverside County, have become a hotbed of solar development, thanks in part to the power lines that run along the freeway. 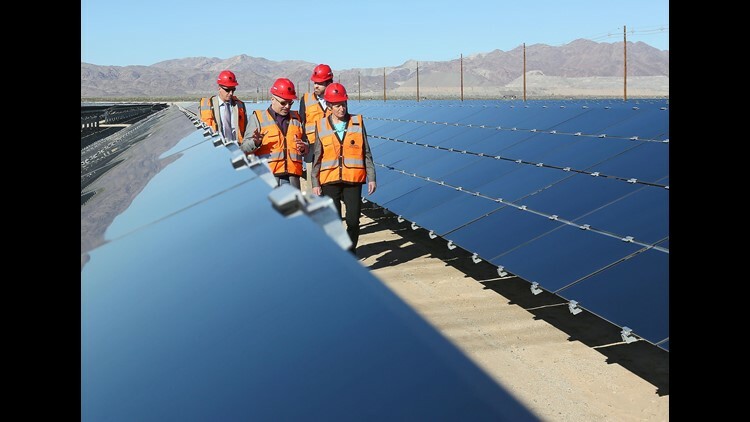 In addition to Palen and Desert Harvest, the area is home to the 550-megawatt Desert Sunlight facility, which was built by Arizona-based First Solar and was briefly the world's largest solar farm when it opened in 2015. Environmentalists generally support renewable energy, since it displaces the coal and gas-fired power plants that contribute to global climate change. 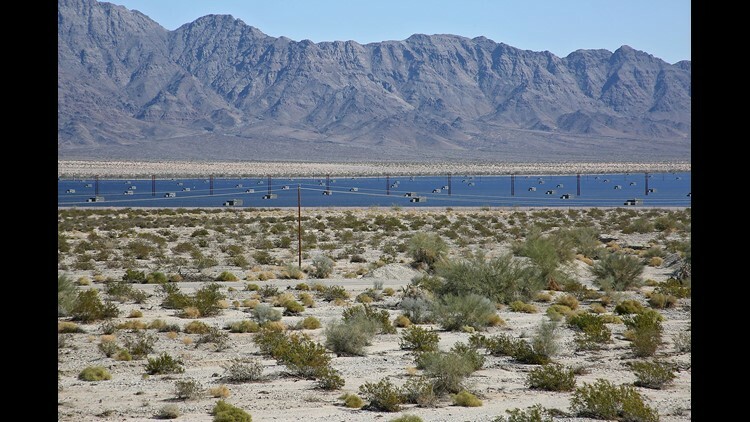 But on public lands in the California desert, conservationists have fought many of the big solar farms that have been proposed, saying they degrade sensitive ecosystems. Some environmentalists are especially concerned about Palen, in part because it would be built eight miles from Joshua Tree National Park, one of the most beloved and iconic places in the desert. Nonprofit groups including the Center for Biological Diversity, Defenders of Wildlife, the National Parks Conservation Association and the Sierra Club filed comments on the draft environmental analysis released in October, arguing it didn't adequately address impacts to fringe-toed lizard and desert tortoise habitat, migrating birds that could crash into the solar panels, and views from the national park, among other issues. But the Trump administration moved ahead with its previous decision to approve a 3,100-acre version of the project, rather than the 4,200-acre version proposed by the developer. Conservationists have said the reduced-footprint version would avoid a large dry wash that runs through the project site. That could limit the damage to microphyll woodlands, where occasional bursts of water nourish vegetation that provides habitat for birds, mammals and reptiles. But the 3,100-acre configuration would extend further into a sand transport corridor that helps nourish Mojave fringe-toed lizard and desert kit fox habitat. A fringe-toed lizard is one of several species protected by the Coachella Valley Multiple Species Habitat Conservation Plan. The Colorado River Indian Tribes, which have 4,400 members and a 300,000-acre reservation along the California-Arizona border, also submitted comments. In a letter to federal and Riverside County officials, tribal chair Dennis Patch said the tribe's ancestral homelands "extend far beyond the Reservation boundaries" and would be harmed by Palen. "Significant portions of public and private lands in California, Arizona, and Nevada were occupied by the ancestors of the Tribes' Mohave and Chemehuevi members since time immemorial. These landscapes remain imbued with substantial cultural, spiritual, and religious significance for the Tribes' current members and future generations," Patch wrote. "For this reason, we urge BLM and the County to deny the proposed Project, which has the potential to transform this cultural landscape to an industrial one." Palen isn't the only fight between environmentalists and the Trump administration over renewable energy in California. The Interior Department said earlier this year it would consider changes to the Desert Renewable Energy Conservation Plan, a sweeping land-use strategy that protects millions of acres of public lands in the desert while setting aside a few hundred thousand acres for solar and wind farms. The Trump administration said the plan makes it too difficult to build renewable energy projects in California. Many solar and wind developers agree, saying the desert plan could prevent California from meeting its ambitious goals for fighting climate change. But conservationists say the desert plan should remain in place. And they question whether the Trump administration is really interested in helping the solar and wind industry, given the well-known preference of Trump and many of his appointees for fossil fuels. The Desert Sun reported earlier this month that changes to the California desert plan could also help a small company with a well-connected lawyer build communications towers on public lands in the desert, improving cell service and internet access in remote areas.